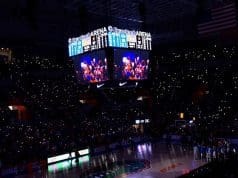 The Florida Gators recruiting efforts finished the regular season strong with a huge win over Florida State and the coaching staff is now out on the road visiting prospects for the second straight week. Mullen and his coaching staff have been hitting the road hard since the day after Florida State and will host the second round of visitors this weekend. Camtheman: Since the offensive line seems to be in good shape, how do you see us finishing on the other side, particularly at defensive tackle? 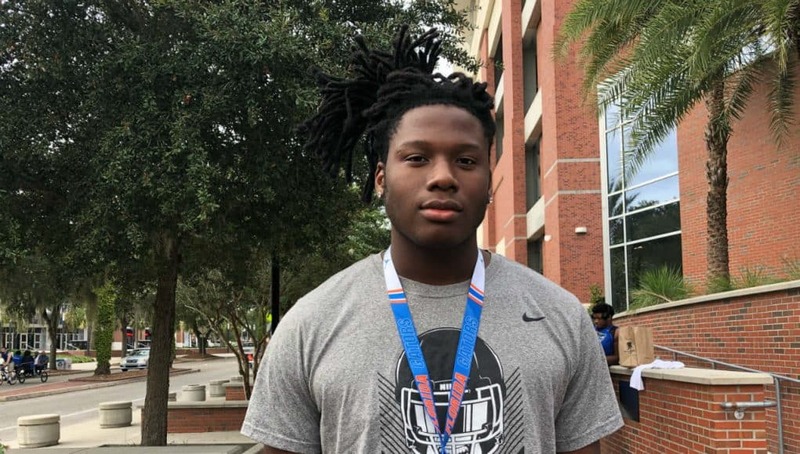 AS: On the defensive line Florida is recruiting Nathan Pickering, Derick Hunter, Quashon Fuller, Jaren Handy, Derick Hall, Kayvon Thibodeaux, Khris Bogle, Lloyd Summerall, Byron Young and Brandon Dorlus. A few of the guys like Dorlus and Young could play some inside but aren’t true defensive tackles. Out of all those guys Florida is trending up with Hunter, Fuller, Summerall and Dorlus. 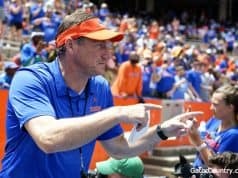 Macbgator: Will we take more offensive line, if so how many??? AS: Florida is still looking to take more offensive linemen in the class. They’re going after Evan Neal, Dontae Lucas, Ira Henry, Keiondre Jones, Kamaar Bell and Deyavie Hammond. Macbgator: How many more defensive backs will we take and who are our strongest leans??? AS: The strongest lean at this time is Chris Steele but Florida is trending with Cordale Flott and Kaiir Elam at this time. Gatorzfan: Your thoughts on Ira Henry offensive line out of St. Louis. He seems like a good fit at tackle. At 6’5″ 320 would think he is athletic. AS: Good prospect that would be a real good fit for Florida and he’s planning to visit in January. Missouri is the team with the edge right now but he doesn’t sign until February. Timmyolson: Any OSU targets open up for us now Urban is gone? AS: Jordan Battle is the one Ohio State commit that Florida has been recruiting but Miami looks to be the team to beat for him. Aesgator: Might be a broken record but is there any new information regarding Will Putnam or has this ship sailed? AS: Florida isn’t recruiting Putnam at this time. Florida State and Auburn are the teams to watch for Putnam. Irgator12: Who else are we flipping? AS: These guys are all talking to Florida and committed else. FSU commits Derick Hunter, Dontae Lucas and Quashon Fuller, Florida is trending up for both Hunter and Fuller at the time. Mississippi State commit Nathan Pickering who Florida did a good job with on his official but are battling State and Alabama. Auburn commits Jaren Handy and Keiondre Jones are talking to Florida but at this time the Gators have a lot of work to do with both. LSU commit Cordale Flott is expected on campus next weekend and the Gators have a real shot here. OklahomaGator: Final class size in the 24-26 range (counting transfers)? AS: I say 25 is where Florida ends up but again the numbers always work themselves out. Guys will transfer and leave for the NFL early to help get the numbers to 25. Gatorbd: Do you think we end up with a top ten class when all is said and done? AS: If things go the way it’s looking at this time, a top 10 class is likely for Florida. Again things have to go the way of Florida but getting a top 10 class is likely. Lammygator69: Should Florida fans be concerned about TRob and muschamp with Hopper and Steele? I don’t like South Carolina mods confidence right now. AS: Muschamp goes in-home with Chris Steele next week so that’s something to watch but right now I feel as if Florida is the team to beat for Steele. Steele really likes Dan Mullen and the DBU tradition in Gainesville. As far Hopper goes, the Gators will host him on campus this weekend and he’s been solid to Florida and is very high on Christian Robinson. I think Florida hangs on to Hopper. Polkgator: If Brandon Dorlus commits does that influence Fuller or Hunter?? AS: No, Florida is ready to take all three of those guys. Dorlus is a bigger guy who could play inside for the Gators and is a different type of player than Fuller and Hunter. All three guys are really wanted by Florida’s staff. Salgado: With all the new recruits do we still go after Jucos like Blades or do we focus on primo HS players? AS: I don’t see Florida going after any JUCO’s until after the early signing period and I don’t see them going after Elijah Blades at all. Florida will wait to see how things shake out with the early signing day and then see what the needs are. OaktownGator: Also what do you expect in terms of post season shifts in recruit rankings? Any of our three stars likely to bump to four stars? Marks maybe? AS: I could see guys like Chester Kimbrough, Dionte Marks and even Jalon Jones getting a bump in the rankings. The rest of the commits are ranked pretty accurate at this time. Nay’Quan Wright is a guy that I think could move up some but not sure he gets his fifth start. Emaness: What’s the latest with Mark-Antony Richards? AS: Auburn, Florida and Miami are all squarely in the mix with Penn State also there. With Auburn losing its offensive coordinator that will hurt the Tigers some but Gus Malzahn has done a good job of recruiting Richards himself. January official visits will be key for Richards. Graylon: When is Quashon Fuller suppose to sign? AS: Fuller is signing in February and is expected to visit Florida in January. 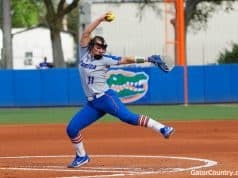 The Gators are doing a good job here and just need to get mom on board for Florida to really have a shot at flipping the Florida State. Shade45: How is defensive line and safety recruiting going? Who are we most likely to sign there? AS: I hit on defensive line recruiting above but at safety, there isn’t a lot of options there. Most of the defensive backs Florida is recruiting are cornerbacks. One of Tyron Hopper or Diwun Black could slide back there in a pinch if needed. Kaiir Elam, Chris Steele, Jaydon Hill, Chester Kimbrough and Cordale Flott are all guys that fit better corner. Trent Whittemore however is a safety. Jake37: Why is Florida State still out recruiting us after their disaster of a year ? I really Dan like Mullen but it concerns me ? We need to win the recruiting battle especially in the state ? AS: I’m not sure how Florida State is out recruiting Florida but they aren’t at all. In fact Florida is hosting many of FSU’s commits on campus and are in great shape to flip a couple of those guys. Mullen is out recruiting Willie Taggert by a good margin now. Juggernautz: Any update on Trey Sanders? AS: Sanders is expected to be on campus for an official visit next weekend. Florida has a little ground to make up on Alabama but still a chance.